SubqueryExec uses relationFuture that is lazily and executed only once when SubqueryExec is first requested to prepare execution that simply triggers execution of the child operator asynchronously (i.e. on a separate thread) and to collect the result soon after (that makes SubqueryExec waiting indefinitely for the child operator to be finished). FIXME When is doPrepare executed? 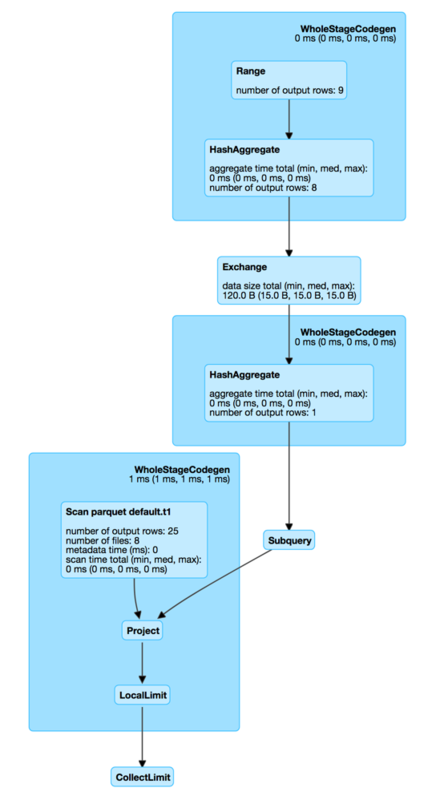 SubqueryExec is created exclusively when PlanSubqueries preparation rule is executed (and transforms ScalarSubquery expressions in a physical plan). SubqueryExec physical operator is almost an exact copy of BroadcastExchangeExec physical operator. doPrepare simply triggers initialization of the internal lazily-once-initialized relationFuture asynchronous computation. When "materialized" (aka executed), relationFuture spawns a new thread of execution that requests SQLExecution to execute an action (with the current execution id) on subquery daemon cached thread pool. relationFuture uses Scala’s scala.concurrent.Future that spawns a new thread of execution once instantiated. The action tracks execution of the child physical operator to executeCollect and collects collectTime and dataSize SQL metrics. In the end, relationFuture posts metric updates and returns the internal rows. relationFuture is executed on a separate thread from a custom scala.concurrent.ExecutionContext (built from a cached java.util.concurrent.ThreadPoolExecutor with the prefix subquery and up to 16 threads). relationFuture is used when SubqueryExec is requested to prepare for execution (that triggers execution of the child operator) and execute collect (that waits indefinitely until the child operator has finished). executeCollect is part of SparkPlan Contract to execute a physical operator and collect the results as collection of internal rows. executeCollect waits till relationFuture gives a result (as a Array[InternalRow]).